Chronic obstructive pulmonary disease (COPD) has extensively been reported as a complex disease affecting patients' health beyond the lungs with a variety of intra- and extrapulmonary components and considerable variability between individuals. This review discusses the assessment of this complexity and underlines the importance of transdisciplinary management programmes addressing the physical, emotional and social health of the individual patient. COPD management is challenging and requires advanced, sophisticated strategies meeting the patient's individual needs. Due to the heterogeneity and complexity of the disease leading to non-linear and consequently poorly predictable treatment responses, multidimensional patient profiling is crucial to identify the right COPD patient for the right treatment. Current methods are often restricted to general, well-known and commonly used assessments neglecting potentially relevant (interactions between) individual, unique “traits” to finally ensure personalised treatment. Dynamic, personalised and holistic approaches are needed to tackle this multifaceted disease and to ensure personalised medicine and value-based healthcare. Chronic obstructive pulmonary disease (COPD) has extensively been reported as a complex disease affecting patients’ health beyond the lungs with a variety of intra- and extrapulmonary components and considerable variability between individuals [1–6]. Unfortunately, current reductionist approaches of COPD often ignore this complexity and heterogeneity [7, 8]. The complexity of COPD has already been highlighted, for instance by Frey and Suki  who critically reviewed reductionist approaches “whereby researchers isolated and identified specific mechanisms from the complex web of interacting subsystems” and suggested a multidimensional, complex systems approach also considering the unpredictable nature of COPD. During recent years, multidimensional assessment of COPD has been increasingly studied as well as (trying to be) incorporated in clinical practice [9–11]. Unfortunately, methods are often restricted to general, well-known and commonly used assessments, which are easily performed, interpretable and comparable between individuals or groups (e.g. questionnaires) but which neglect potentially relevant (interactions between) individual, unique “traits” (i.e. underlying explanatory mechanisms) to finally ensure personalised treatment. Given our increasing understanding of COPD as a heterogeneous and complex disease, it is important to accentuate that, in this context “complex” means that COPD has a number of intrapulmonary and extrapulmonary components whose dynamic interactions over time are not linear, whereas “heterogeneous” indicates that not all of these components are present in all individuals at any given time-point . An overview of methods assessing and involving this heterogeneity and complexity will be discussed below and are illustrated in table 1. To honour the 20th anniversary of the Global Initiative for Chronic Obstructive Lung Disease (GOLD), Rodriguez-Roison et al. recently summarised the key differences of the major revisions of the GOLD documents (2001–2017) clearly demonstrating a shift from a solely spirometric staging system to a more extensive classification. The 2006 GOLD statement classified COPD patients into four groups (GOLD stages I to IV), exclusively based on the degree of airflow limitation . Since this parameter is only poorly to moderately associated with disease activity, progression and prognosis, the 2011 GOLD strategy started classifying patients into four new groups (GOLD groups A to D) based on the combination of the degree of airflow limitation and the number of exacerbations and the severity of symptoms . The latest 2017 GOLD strategy separated spirometric assessment from symptoms and risk evaluation aiming to facilitate tailored treatment to the needs of the individual patient and proposed patients' symptoms and exacerbation history alone to assign patients to ABCD categories . However, exacerbation history as a decisive parameter has not been validated; a recent study showed that exacerbation frequency is highly variable over time, while the frequent exacerbator phenotype (two or more exacerbations every year) was the most uncommon one . Extrinsic factors might further impact exacerbation occurrence making these events difficult to predict . Furthermore, variations may occur in the pathophysiology of exacerbations over time in an individual patient, which is a currently unexplored topic and adds to the complexity of COPD. Finally, the choice of symptom measure and/or cut-off point used impacts the classification of patients with COPD into GOLD A/C or B/D groups which can result in misclassification and, consequently, different treatment recommendations . During the past decade, multidimensional indices including medical, pathophysiological, symptomatic and/or psychological parameters have been developed as screening instruments [11, 15] or prognostic markers for COPD . Prognostic performance of multidimensional indices providing composite scores (e.g. the BODE (body mass index, airflow obstruction, dyspnoea and exercise) index ) is moderate to good, but it is still unknown if they improve COPD disease management or patients' health . Another example of providing a more detailed patient profile is the Nijmegen Clinical Screening Instrument which is an empirically composed battery of existing instruments providing a detailed picture of 21 dimensions of an individual patient's integrated health status and thus guides individualised treatment [15, 26]. It has been suggested that, on the one hand, multidimensional indices might be useful in grouping patients in terms of clinically relevant outcomes; and on the other hand, it is also possible that by grouping patients this way distinct features of the disease might be grouped, blurring the heterogeneity and understanding of the disease . Indeed, it has been suggested that prognostic indices cannot identify or substitute groups or phenotypes since patients sharing a similar prognosis based on a single score might not be considered as belonging to the same phenotype . As further clarified, they are not risk factors or phenotypes but useful measures of disease severity to establish prognosis . A phenotype has been defined as “a single or combination of disease attributes that describe differences between individuals with COPD as they relate to clinically meaningful outcomes (symptoms, exacerbations, response to therapy, rate of disease progression, or death)” . In the 1960's, the terms “blue bloater” and “pink puffer” came up to describe patients with chronic bronchitis and emphysema, respectively , marking the very beginning of phenotyping COPD. Commonly used phenotypes are often based on pulmonary disease characteristics like the presence of emphysema, chronic bronchitis, overlap asthma-COPD and/or (in)frequent exacerbations . Mirza and Benzo  recently described several “easily identifiable” and “clinically meaningful” COPD phenotypes and added the upper lobe-predominant emphysema phenotype, rapid decliner phenotype, comorbid COPD phenotype, physical frailty phenotype and emotional frailty phenotype with the purpose of guiding personalised and effective care. Using phenotypes to classify and/or screen patients might be an interesting alternative to currently used criteria for recruiting patients in clinical trials  and might help optimising (non)pharmacological integrated treatment , but the application into routine clinical practice and to facilitate personalised medicine is questionable since phenotypes still group patients and therefore potentially ignore individual characteristics. Indeed, the same clinical phenotype could result from different endotypes . Cluster analysis has been defined as a group of analysis techniques that aim to organise information so that heterogeneous subjects can be classified into homogeneous subgroups (i.e. clusters) which may further identify novel phenotypes . To identify phenotypes, clinical features, imaging, pulmonary function, exercise tests, biomarkers and comorbidities may be used . However, the current understanding of phenotypes might be biased since there is a significant heterogeneity in the selection of subjects and statistical methods used, as well as a lack of information about different COPD populations (including women, never-smokers and those with mild disease) which challenges the clinical application of the defined phenotypes [28, 36]. Indeed, a recent study assessing the reproducibility of COPD clustering subtypes concluded that identical clustering analyses across multiple COPD cohorts showed modest reproducibility . Furthermore, it is known that subtypes (phenotypes) might change over time , underlining the need for continuous evaluation of a given phenotype. Finally, a systematic review showed that the number of phenotypes ranged from two to five , which seems rather limited for personalised approaches. Nonetheless, phenotyping and/or clustering patients might be a useful screening procedure differentiating between individuals; further validation of statistical clustering techniques is needed to refine and elaborate (existing) clusters. Agusti and MacNee  suggested to use a “control panel” including at least three dimensions (severity, activity and impact) to assess different elements of the disease (in a single patient at a given time-point) to visualise the complexity of COPD and to move COPD management towards personalised medicine. These three modules containing biological and clinical variables can provide complementary and relevant information for the proper management of the individual patient. It can be customised to the needs of the patient and the available resources (e.g. rural versus urban healthcare centres and primary versus specialised care) . The “control panel” may further serve as a clinical decision support system . However, which treatable clinical characteristics should exactly be assessed and which methods and cut-off points should be used has not yet been formally validated. Furthermore, a control panel does not reveal any complex interactions, possibly resulting in fragmented treatment . Based on the control panel, the appellation “treatable traits” has recently been introduced which refers to a “label-free, precision medicine approach to the diagnosis and management of chronic airway diseases” , while precision medicine is defined as “treatments targeted to the needs of individual patients on the basis of genetic, biomarker, phenotypic, or psychosocial characteristics that distinguish a given patient from other patients with similar clinical presentations” . As suggested earlier, patients with COPD should be assessed and treated according to their individual treatable characteristics, which is further likely to improve clinical outcomes . Management of airway diseases based on individual treatable traits present in each subject has been suggested: “these traits can be ‘treatable’ based on ‘phenotypic’ recognition (and thereby probabilistic evidence based on positive and negative predictive values) or on deep understanding of the critical causal pathways (e.g. true ‘endotypes’)” . The authors suggested a variety of treatable traits (which can coexist) summarised into three groups: pulmonary treatable traits, extrapulmonary treatable traits and treatable behaviour/lifestyle risk factors. Remarkably and importantly, the patients' environment (family and social support) has been included as a distinct treatable trait . Assessing “treatable traits” has been suggested as a way to facilitate precision medicine, although individual variability in genes is not part of this disease treatment. Furthermore, this approach focusses on the assessment of several separate traits [18, 19], while integrated holistic approaches are needed to tackle the complexity of every unique patient. Furthermore, a global outline of treatable traits consequently rather leads to general treatment recommendations without the suggested “deep understanding of the critical causal pathways”  than facilitates personalised medicine understanding evident complexity of the disease. Finally, besides the assessment of specific traits, the evaluation of outcomes and reassessment of treatable traits during follow-up, including readjustment of treatment as well as new outcome assessment, are essential. In summary, the multidimensional approaches illustrated above are assessing the heterogeneity of the disease, rather than tackling the complexity of the disease. One tool can neither guarantee a personalised approach nor provide a patient profile enabling individualised treatment . A control panel or treatable traits approach is largely driven by disease characteristics, resulting in fragmented treatment of identified traits ; a list of variables does not reveal complex interactions consequently leading to patient-tailored treatment. Complex goals need complex solutions . Personalised medicine or treatment strategies require personalised assessment including pulmonary and extrapulmonary as well as personal, social and environmental factors. As shown by a factor analysis including 16 demographic and clinical characteristics (i.e. age, body mass index, pre-bronchodilator forced expiratory volume in 1 s (FEV1), pre-bronchodilator FEV1/forced vital capacity or FEV1/vital capacity, FEV1 reversibility, St Georges’ Respiratory Questionnaire total score, months since first COPD symptoms, systolic and diastolic blood pressure, pulse, morning peak expiratory flow (PEF), PEF variability, scores of breathlessness, cough, sleep disturbance and reliever use), six factors of characteristics explained ∼60% of COPD heterogeneity , resulting in 40% which still remained unexplained. Other relevant characteristics (e.g. functional performance, personal or social factors and biomarkers) are missing in this analysis and might explain part of the remaining variance. Thus personalised and holistic approaches are needed to facilitate a full understanding of (the impact of) the disease. When personalisation is viewed as “tailoring medicine to patient preferences, further work is needed regarding: revealed preferences, e.g. treatment (non)adherence; stated preferences, e.g. risk interpretation and attitude; consideration of heterogeneity in preferences; and the appropriate framework to incorporate non-health benefits” . Personalised approaches require holistic approaches; an integrated, all-embracing understanding of the disease, since COPD is the end result of a complex set of interactions between the environment, the genetic background of the individual and biological networks . Indeed, “personalised medicine must consider human beings as composed of and operating within multiple interacting and self-adjusting systems where illness arises from the dynamic interaction within and between these systems” . Below, we will discuss three examples of complex interactions of (and within) disease characteristics demonstrating the (underlying mechanisms of) individual, unique “traits”. Patients with COPD report a variety of problematic activities in daily life [46, 47] of which walking is most frequently reported . Field-based walking tests are the most commonly used and reported tests. However, these tests are a quantitative identification of the patient's walking abilities rather than a qualitative description of the individual's performance. Generally, these tests do not consider problems or inconveniences patients perceive during the particular activity. Research has shown that patients with COPD are at increased risk for frailty , have an impaired balance  and an altered gait pattern compared to controls [50, 51]. Thus, understanding the individual's limitations would enhance the possibilities for a personalised approach, e.g. sophisticated gait analyses. Alternatively, for instance, the Canadian Occupational Performance Measure (COPM) might be used to assess functional performance . The COPM is an individualised scale assessing patients’ problematic activities of daily life. Patients have to rate the perceived performance as well as satisfaction for relevant problematic activities , which may provide a better understanding of the individual physical limitations as well as abilities. A qualitative study revealed social barriers (lack of time, overprotective family members) and enablers (social support) and a variety of personal barriers and enablers (figure 1) that limit and encourage, respectively, participation in physical activity in patients with COPD. The authors conclude that “it is important to understand the patient-specific social cognitive influences on physical activity participation” which might consequently facilitate individually tailored management planning . This study clearly demonstrates the necessity to detect and understand underlying individual factors to finally enable personalised medicine and respond to the individual patient's needs. Examples of personal barriers and enablers that both encourage and limit participation in physical activity for patients with chronic obstructive pulmonary disease (COPD). PA: physical activity. Reproduced from  with permission. As already illustrated in figure 1, patients’ physical activity can be affected by their social network , i.e. by their resident loved ones. Indeed, patients with an active loved one are also more active themselves . A recent study demonstrated that structural support (e.g. living status, having a partner, having a caregiver) is associated with higher levels of physical activity and greater participation in pulmonary rehabilitation in patients with COPD while higher functional support was associated with, for instance, lower odds of smoking . Furthermore, patients with more perceived social support experienced fewer depressive symptoms through the use of problem-oriented coping strategies . Thus, the patients’ home environment plays an important role in the process of disease management emphasising the need to include it as a relevant part for treatment strategies . However, the process of informal caregiving is complex . For instance, partners were often not able to identify patients’ most important problematic activities  and are often current smokers and have (undiagnosed) morbidities . Unfortunately, caregivers often feel unsupported and are often overlooked as important members of the interdisciplinary treatment team . Thus, patients, caregivers, healthcare providers and society are all engaged in managing life with COPD , emphasising the need for holistic models considering patient's family and social context . Facilitating personalised disease management requires the assessment of individual parameters, as outlined above. Patient-Reported Outcome (PRO) is “any report of the status of a patient's health condition that comes directly from the patient, without interpretation of the patient's response by a clinician or anyone else” . The importance of PRO's in clinical practice as well as research will substantially increase in the coming years . Linking to example 2, patients with more perceived social support experienced fewer depressive symptoms . Anxiety and depression have been identified as one of the most important COPD-related comorbidities . However, anxiety and depression are most commonly assessed and consequently most commonly reported (to define psychological impairment) raising the interest and need to assess other underlying mechanisms or individual psychological factors which may play a central role in COPD management. For instance, patients with symptoms of anxiety and depression reported a lower use of active confronting coping (i.e. actively seeking information, solutions and/or support) . A qualitative study revealed that patients are struggling with acceptance of their disease which even precludes patients from progress during their pulmonary rehabilitation programme . Indeed, acceptance of the disease is associated with behaviour change . Furthermore, acceptance of the diagnoses and limitations, having a realistic disease understanding and developing a rational response to the disease are ways of enabling taking control . Another considerable outcome is emotional intelligence, i.e. the capacity to understand and manage personal thoughts and feelings, as well as to positively influence interpersonal communication and social well-being, which has been shown to be associated with self-management abilities and health status . Furthermore, health status measurement has previously been described as an essential process which is “no more ‘soft’ or ‘touchy-feely’ than any well taken clinical history” , supporting health status as an increasingly important PRO in the assessment of COPD . Indeed, health status has been shown to be associated with exacerbations, hospitalisations and dying . Also fatigue has been shown to be associated with hospitalisation risk . Although fatigue is a common and important symptom in patients with COPD [74, 75], it is often assessed related to exercise testing. Furthermore, it is still underdiagnosed and consequently undertreated . As it has been described as a “central driver of functional disability, to the same extent as dyspnoea”  (linking to example 1), recent studies emphasise the importance of assessing fatigue as a separate outcome [77, 78]. The patient's (unbiased) experiences and expectations about the patient's own life, values and preferences play a central role in healthcare, since they are the ones living with the disease and are ultimately responsible for their lives. Indeed, as suggested by a Dutch report, key concepts of future healthcare are encouraging patients’ functionality and independency, adaptability and flexibility as well as control, autonomy and self-management . Thus, Patient Reported Experience Measurements assessing the beneficial values for the patient are becoming relevant outcome parameters . Indeed, rating and understanding patients’ satisfaction and interpreting their feedback (co-creation) provides important insights and outcomes to finally improve healthcare services . The non-linear and consequently poorly predictable treatment responses caused by the disease  further support the dynamic interactions as demonstrated above. Spruit et al. demonstrated that responses to regular outcomes in patients with COPD completing pulmonary rehabilitation are differential and concluded that “choosing only one or two outcomes as key performance indicators seem to ignore the clinical complexity of rehabilitating patients with COPD”. It is not about severity but complexity of the disease. Pulmonary rehabilitation has been defined as a “comprehensive intervention based on a thorough patient assessment followed by patient-tailored therapies which include, but are not limited to, exercise training, education, behaviour change, designed to improve the physical and psychological condition of people with chronic respiratory disease and to promote the long-term adherence to health-enhancing behaviours” . The overall goal of pulmonary rehabilitation is “to return the patient to the highest possible capacity and to contribute to achieve the individual's maximum level of independence and functioning in the community” . Pulmonary rehabilitation, suggested as a future cornerstone of COPD management , provides an appropriate setting tackling the complexity outlined above by offering a personalised, holistic approach which was initially discussed more than 40 years ago. In 1974, the American College of Chest Physicians defined pulmonary rehabilitation as an individually tailored, multidisciplinary programme through accurate diagnosis, therapy, emotional support and education . In 1994, the National Institute of Health defined pulmonary rehabilitation as a multidimensional continuum of services for the patient and family supplied by an integrated team of specialists in complementary disciplines . Pulmonary rehabilitation is a dynamic, individualised, integrated intervention requiring the full range of (medical) expertise, technical skills and specialised facilities addressing carefully identified treatable traits. It is offered by a dedicated team which works within, as well as across, disciplines to realise the individual goals of the unique patient. Figure 2 demonstrates the core process of pulmonary rehabilitation. Appropriate patient selection and an integrated assessment is crucial for successful treatment. Careful identification of treatable traits and treatment goals must form the start of every pulmonary rehabilitation programme. Based on the degree of complexity, a modular treatment programme is composed. Each individualised programme is followed by an outcome measurement of the different domains as described . 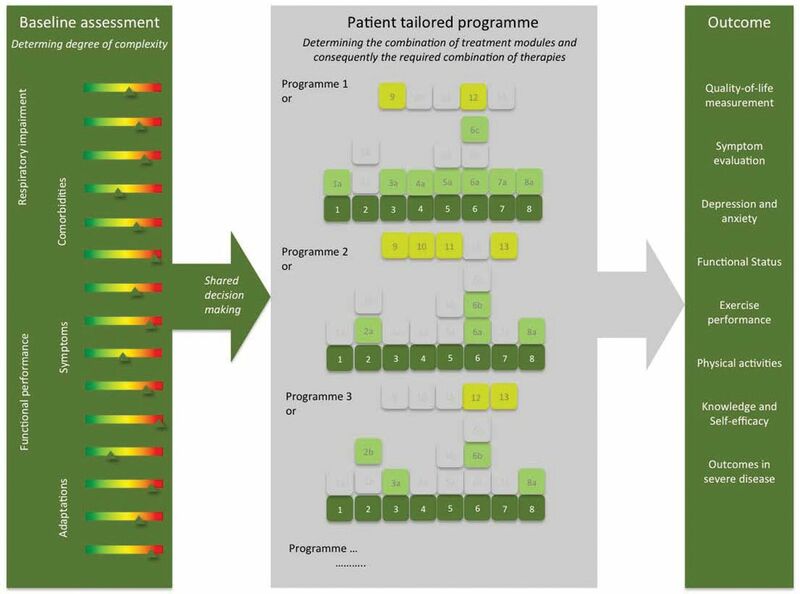 The process of a patient-tailored programme including the three core processes (baseline assessment, tailored treatment and outcome assessment). An integrated baseline assessment identifying the complexity of the disease is followed by a treatment programme composed of at least all basic modules. Depending on the complexity, specific burden-driven modules can be added. Each individualised programme is followed by an outcome measurement. Examples of adaptations include degree of self-management and coping. Reproduced from  with permission. Pulmonary rehabilitation emphasises and relies on the central role of the patient . Especially in chronic diseases, the patient, as a specialist of his own life , is an important member of the treatment team: it is not about curing, it is about life-long caring and learning to live with the disease, handling symptoms and accepting limitations. Indeed, enhancing self-management and empowering patients as well as achieving the individual's maximum level of independence are important goals of pulmonary rehabilitation [20, 21, 86]. Self-management, as also included in the definition of health , supports the concept of “positive health” , emphasising possibilities instead of limitations. We need to qualify patients' abilities instead of quantify their harm. Healthcare providers involved in the management of COPD must be encouraged to target the unique needs and abilities reflecting the individual complexity of every patient (consequently) stimulating anticipation  and to consider the patient's social/home environment . In future, and to enhance self-management, healthcare providers are expected to be competent coaches and advisors with compassion and humanity as key elements in their daily work . In pulmonary rehabilitation, tailored treatment goals are composed not only in collaboration with other professionals but, probably even more importantly, in discussion with the patient . Shared decision making as “an approach where clinicians and patients share the best available evidence when faced with the task of making decisions, and where patients are supported to consider options, to achieve informed preferences” plays a crucial role in personalised treatment approaches. Due to the visual presentation of the results to the health professional as well as the patient, the Nijmegen Clinical Screening Instrument might support the process of shared decision making . Furthermore, a recent study showed that patients were not willing to accept the burden of treatments where they perceived minimal benefit , demonstrating the importance of clear information about benefits and impact of a given treatment. Indeed, in case of complex adaptive systems, a small change can have a large effect in behaviour . Importantly, patients' behaviour is partly determined by unique and adaptive responses to environmental stimuli  underlining the importance of creating a safe and realistic environment for disease management strategies. Yet, there are also some relevant limitations. Pulmonary rehabilitation is mostly a non-pharmacological generic intervention underlining the necessity to integrate medicine and pulmonary rehabilitation by, for instance, implementing optimal treatment of comorbidities in relevant subgroups, applying noninvasive ventilation during exercise training in patients with hyperinflation and exercise-induced desaturation, using anabolic steroids in the treatment of cachexia and/or combining pulmonary rehabilitation with lung volume reduction intervention in eligible patients. Thus, pulmonary rehabilitation is a dynamic, individualised, integrated intervention tackling respiratory and non-respiratory treatable traits. This concept of pulmonary rehabilitation is far away from the eroded approach of pulmonary rehabilitation described in some guidelines, limiting pulmonary rehabilitation to exercise training and self-management instructions [92, 93]. COPD management is challenging and requires advanced, sophisticated strategies meeting the patient's individual needs. Due to the heterogeneity and complexity of the disease leading to non-linear and consequently poorly predictable treatment responses, multidimensional patient profiling is crucial to identify the right COPD patient for the right treatment . Transdisciplinary management programmes realising real benefits by integrating concepts of adaptive systems need to address the physical, emotional and social condition of the individual patient . Dynamic, personalised and holistic approaches, i.e. pulmonary rehabilitation, are needed to tackle the multifaceted disease starting from the patient's perspective to finally ensuring personalised medicine and value-based healthcare: “to cope with escalating complexity in healthcare, it is necessary to abandon linear models, accept unpredictability, respect autonomy and creativity, and to respond flexibly to emerging patterns and opportunities” . Author contributions: Conception and design: all authors. Drafting of the manuscript: S. Houben-Wilke, I.M. Augustin and E.F.M. Wouters. Drafting the manuscript for important intellectual content: all authors. All authors critically revised the article and gave final approval of this version to be published. Conflict of interest: M.A. Spruit reports personal fees from AstraZeneca, Boehringer Ingelheim, GSK and Novartis, outside the submitted work. Conflict of interest: E.F.M Wouters has received fees for board membership from Nycomed and Boehringer, and has received grants from AstraZeneca and GSK. He has also received payment for lectures (including service on speakers bureaus) from AstraZeneca, GSK, Novartis and Chiesi. Conflict of interest: F.M.E. Franssen reports personal fees from AstraZeneca, Chiesi, Novartis, Boehringer Ingelheim, GlaxoSmithKline and TEVA, outside the submitted work.
. The complex challenge of chronic obstructive pulmonary disease. Lancet Respir Med 2015; 3: 917–919. Differential response to pulmonary rehabilitation in COPD: multidimensional profiling. Eur Respir J 2015; 46: 1625–1635. COPD comorbidities network. Eur Respir J 2015; 46: 640–650.
. Phenotypes and disease characterization in chronic obstructive pulmonary disease. Toward the extinction of phenotypes? Ann Am Thorac Soc 2013; 10: Suppl, S125–S130. Personalized medicine and chronic obstructive pulmonary disease. Curr Opin Pulm Med 2017; 23: 241–246. Global Strategy for the Diagnosis, Management, and Prevention of Chronic Obstructive Lung Disease 2017 Report: GOLD Executive Summary. Am J Respir Crit Care Med 2017; 195: 557–582. Multidimensional prognostic indices for use in COPD patient care. A systematic review. Respir Res 2011; 12: 151. Development of the assessment of burden of COPD tool: an integrated tool to measure the burden of COPD. NPJ Prim Care Respir Med 2014; 24: 14021.
. The path to personalised medicine in COPD. Thorax 2014; 69: 857–864. Global Initiative for Chronic Obstructive Lung Disease (GOLD) 20th Anniversary: a brief history of time. Eur Respir J 2017; 50: 1700671. Development of a battery of instruments for detailed measurement of health status in patients with COPD in routine care: the Nijmegen Clinical Screening Instrument. Qual Life Res 2009; 18: 901–912. Do COPD subtypes really exist? COPD heterogeneity and clustering in 10 independent cohorts. Thorax 2017; 72: 998–1006.
. The COPD control panel: towards personalised medicine in COPD. Thorax 2013; 68: 687–690.
. Process of pulmonary rehabilitation and program organization. J Card Pulm Rehabil 2017; 1: 109. Redefining cut-points for high symptom burden of the global initiative for chronic obstructive lung disease classification in 18,577 patients with chronic obstructive pulmonary disease. J Am Med Dir Assoc 2017; 18: 1097.
. A simple method to enable patient-tailored treatment and to motivate the patient to change behaviour. Chron Respir Dis 2012; 9: 259–268.
. Identification of clinical phenotypes using cluster analyses in COPD patients with multiple comorbidities. Biomed Res Int 2014; 2014: 420134. Blue bloater: pink puffer. Br Med J 1968; 2: 677. Distribution and outcomes of a phenotype-based approach to guide COPD management: results from the CHAIN cohort. PloS one 2016; 11: e0160770.
. Chronic obstructive pulmonary disease phenotypes: implications for care. Mayo Clinic 2017; 92: 1104–1112. Integral health status-based cluster analysis in moderate-severe COPD patients identifies three clinical phenotypes: relevant for treatment as usual and pulmonary rehabilitation. Int J Behav Med 2017; 24: 571–583. Multi-dimensional phenotyping: towards a new taxonomy for airway disease. Clin Exp Allergy 2005; 35: 1254–1262. Derivation and validation of clinical phenotypes for COPD: a systematic review. Respir Res 2015; 16: 50. Chronic obstructive pulmonary disease subtypes. transitions over time. PloS one 2016; 11: e0161710.
. Biomarkers, the control panel and personalized COPD medicine. Respirology 2016; 21: 24–33. Personalized respiratory medicine: exploring the horizon, addressing the issues. Summary of a BRN-AJRCCM workshop held in Barcelona on June 12, 2014. Am J Respir Crit Care Med 2015; 191: 391–401. Diagnosis, assessment, and phenotyping of COPD: beyond FEV(1). Int J Chron obstruct Pulm Dis 2016; 11: 3–12. Assessment of Burden of COPD (ABC) tool: perception versus evidence. Eur Respir J 2017; 49: 1602382.
. The problem with eliminating “low-value care”. BMJ Qual Saf 2015; 24: 611–614. Factor analysis in predominantly severe COPD: identification of disease heterogeneity by easily measurable characteristics. Respir Med 2013; 107: 1939–1947. Concepts of “personalization” in personalized medicine: implications for economic evaluation. PharmacoEconomics 2015; 33: 49–59. Problematic activities of daily life are weakly associated with clinical characteristics in COPD. J Am Med Dir Assoc 2012; 13: 284–290. Task-related oxygen uptake during domestic activities of daily life in patients with COPD and healthy elderly subjects. Chest 2011; 140: 970–979. Risk of frailty in elderly with COPD: a population-based study. J Gerontol A Biol Sci Med Sci 2016; 71: 689–695. Balance impairment in patients with COPD. PloS one 2015; 10: e0120573. Differences in walking pattern during 6-min walk test between patients with COPD and healthy subjects. PloS one 2012; 7: e37329. van der Geest JN, et al. Gait patterns in COPD: the Rotterdam Study. Eur Respir J 2015; 46: 88–95. Validity of the Canadian occupational performance measure: a client-centred outcome measurement. Clin Rehabil 2004; 18: 660–667. Barriers and enablers of physical activity engagement for patients with COPD in primary care. Int J Chron Obstruct Pulm Dis 2017; 12: 1019–1031. Activity levels and exercise motivation in patients with COPD and their resident loved ones. Chest 2017; 151: 1028–1038. Association between social support and self-care behaviors in adults with chronic obstructive pulmonary disease. Ann Am Thorac Soc 2017; 14: 1419–1427. The effects of personal resources and coping strategies on depression and anxiety in patients with chronic obstructive pulmonary disease. Heart Lung 2013; 42: 473–479. van den Bogaart EH, et al. Informal caregivers of patients with COPD: home sweet home? Eur Respir Rev 2015; 24: 498–504. Day-to-day living with severe chronic obstructive pulmonary disease: towards a family-based approach to the illness impacts. Psychol Health 2014; 29: 967–983. Patient versus proxy-reported problematic activities of daily life in patients with COPD. Respirology 2017; 22: 307–314. Health status and morbidities in resident relatives of patients with COPD. J Am Med Dir Assoc 2016; 17: 276 e271–278. Negotiating the care-giving role: family members’ experience during critical exacerbation of COPD in Norway. Health Soc Care Community 2017; 25: 612–620. The empowerment of elderly patients with chronic obstructive pulmonary disease: managing life with the disease. PloS one 2017; 12: e0174028.
. Patient and public involvement in chronic illness: beyond the expert patient. BMJ 2009; 338: b49.
. Patient reported outcome measures in chronic obstructive pulmonary disease: which to use? Expert Rev Respir Med 2016; 10: 351–362. Management of chronic obstructive pulmonary disease beyond the lungs. Lancet Respir Med 2016; 4: 911–924. The relationship between coping styles and clinical outcomes in patients with COPD entering pulmonary rehabilitation. COPD 2013; 10: 316–323. 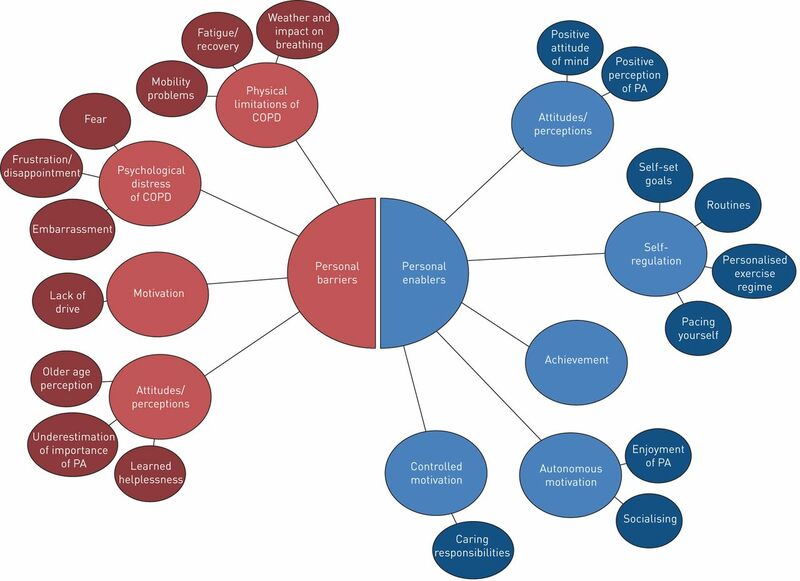 A qualitative assessment of COPD patients’ experiences of pulmonary rehabilitation and guidance by healthcare professionals. Respir Med 2014; 108: 500–510.
. Patient coping strategies in COPD across disease severity and quality of life: a qualitative study. NPJ Prim Care Respir Med 2016; 26: 16051. Emotional intelligence: a novel outcome associated with wellbeing and self-management in chronic obstructive pulmonary disease. Ann Am Thorac Soc 2016; 13: 10–16.
. Health status measurement in chronic obstructive pulmonary disease. Thorax 2001; 56: 880–887. One-year change in health status and subsequent outcomes in COPD. Thorax 2015; 70: 420–425. Fatigue in COPD: association with functional status and hospitalisations. Eur Respir J 2013; 41: 565–570. Course of normal and abnormal fatigue in patients with chronic obstructive pulmonary disease, and its relationship with domains of health status. Patient Educ Couns 2011; 85: 281–285. Experience of fatigue, and its relationship to physical capacity and disease severity in men and women with COPD. Int J Chron Obstruct Pulm Dis 2014; 9: 17–25.
. Measuring fatigue as a symptom in COPD: from descriptors and questionnaires to the importance of the problem. Chron Respir Dis 2015; 12: 179–188. The Effect of fatigue and fatigue intensity on exercise tolerance in moderate COPD. Lung 2016; 194: 889–895. Factors associated with experience of fatigue, and functional limitations due to fatigue in patients with stable COPD. Ther Adv Respir Dis 2016; 10: 410–424.
. Naar nieuwe zorg en zorgberoepen: de contouren [Towards new care and care professions: the contours]. www.rijksoverheid.nl/…/naar-nieuwe-zorg-en-zorgberoepen-de-contouren.pdf Date last updated: April 10, 2015; date last accessed: September 26, 2015.
. Visiedocument: Medisch Specialist 2025: ambitie, vertrouwen, samenwerken. 2017. www.demedischspecialist.nl/sites/default/files/Visiedocument%20Medisch%20Specialist%202025-DEF.pdf Date last accessed: March 29, 2017. A practical model of value co-creation in healthcare service. Procedia Manufacturing 2015; 3: 200–2007.
. Pulmonary rehabilitation: the next steps. Lancet Respir Med 2016; 4: 172–173. American Thoracic Society. Medical Section of the American Lung Association. Pulmonary rehabilitation. Am Rev Respir Dis 1981; 124: 663–666.
. Pulmonary rehabilitation research. Am J Respir Crit Care Med 1994; 149: 825–833. The patient with a complex chronic respiratory disease: a specialist of his own life? Expert Rev Respir Med 2017; 11: 919–924. An official European Respiratory Society/American Thoracic Society technical standard: field walking tests in chronic respiratory disease. Eur Respir J 2014; 44: 1428–1446. How should we define health? BMJ 2011; 343: d4163. Towards a “patient-centred” operationalisation of the new dynamic concept of health: a mixed methods study. BMJ Open 2016; 6: e010091. Implementing shared decision making in the NHS. BMJ 2010; 341: c5146.
. Patient-perceived treatment burden of chronic obstructive pulmonary disease. Int J Chron Obstruct Pulm Dis 2017; 12: 1641–1652.
. Complexity science: complexity and clinical care. BMJ 2001; 323: 685–688.
. Chronic obstructive pulmonary disease in adults. https://www.nice.org.uk/guidance/qs10/resources/chronic-obstructive-pulmonary-disease-in-adults-pdf-2098478592709 Date last updated: February 2016; date last accessed: November 2017.
. COPD health-care delivery: a holistic and dynamic approach is needed. Lancet Respir Med 2016; 4: e30–e31.